The word "Diamond" comes from the greek word "Adamas", which means indestructible. It is the only gem known to man that is made of a single element, Carbon, besides graphite. 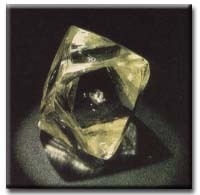 Diamond is completely made of Carbon atoms (Chemical Composition - 'C') crystallised in a cubic (isometric) arrangement. How and where are diamonds formed? Diamonds form between 120-200 kms or 75-120 miles below the earth's surface. According to geologists the first delivery of diamonds was somewhere around 2.5 billion years ago and the most recent was 45 million years ago. That is a long time, my friend! According to science , the carbon that makes diamonds, comes from the melting of pre-existing rocks in the Earth's upper mantle. There is an abundance of carbon atoms in the mantle. 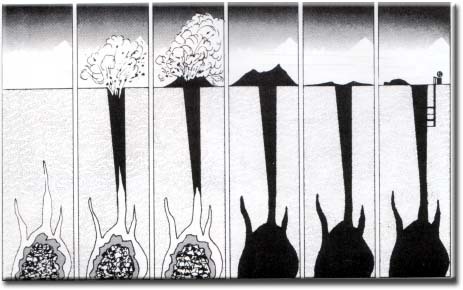 Temperature changes in the upper mantle forces the carbon atoms to go deeper where it melts and finally becomes new rock, when the temperature reduces. If other conditions like pressure and chemistry is right then the carbon atoms in the melting crustal rock bond to build diamond crystals. There is no guarantee that these carbon atoms will turn into diamonds. If the temperature rises or the pressure drops then the diamond crystals may melt partially or totally dissolve. Even if they do form, it takes thousands of years for those diamonds to come anywhere near the surface. Are you guys with me? A lot of information, huh! Let's continue! Diamond's journey to the surface? Diamond deposits are called Kimberlite Pipes or Blue Ground. These are also called Primary Mines. On the other hand, diamonds are also found at river beds. These are Alluvial Deposits. So you see that Mother Nature has to toil for millions of years to make a diamond. When you own a piece of diamond, you own something which is a legend in the making. It has not been made in a factory just the other day. A diamond comes from the bosom of the earth. More interestingly not all the diamonds mined are made into jewelry. Only one fourth quantity that is mined is made into jewelry. Every 100 tons of mud produces one carat of a diamond. And might I add, this one carat is not one stone! It could be anything from 0.005 ct to 1 ct.
Would you like to see how a rough diamond looks? This image on your right is an example of a rough diamond. This particular one is called a 'Glassy'. Glassy is a rough diamond that comes out clean from the mines and does not require polishing. It is very rare to get a glassy. Diamonds come in different rough shapes. This one is an octahedron. The next time you look at your diamond, think about the amount of time, energy and resources have gone into making that one. Something for you to ponder about!! !